The New York Knicks continue to get punch after punch and after the horrific loss against the Jazz, they checked another one (not as terrible though) in Sacramento. Trailing by 19 in the third quarter, the Knicks made a comeback and actually had a shot at winning the game. With just under 5 seconds ’till the final buzzer and down by 2, Carmelo Anthony received an inbound pass and drove all the way to the three point line where he fired, but his shot went cold. 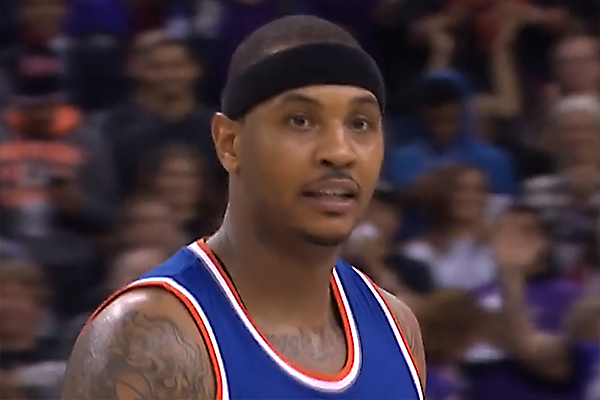 Final score, Knicks 97, Kings 99. With Rajon Rondo‘s hands grabbing Anthony, the referees could have blown the whistle and send the Knicks’ star to the free throw line to finish the game, in spite of his recent comments (Anthony complained on Wednesday about his frustrations against the officials that keep ignoring him because he doesn’t know “how to flop“). Anthony finished in double-double with 23 points, 14 rebounds and 4 assists. Kristaps Porzingis was praised by Kings’ coach, George Karl who was very impressed by the Knicks rookie and predicted him to be a legit contender for the Rookie of the year alongside with Wolves’ Karl Anthony-Towns. Porzingis had 13 points and 7 rebounds, a slightly better performance than the one he had the other night in Salt Lake City. Arron Afflalo contributed with 14 points while Lance Thomas scored 10 points and added 6 rebounds off the bench. The Knicks (now 10-14) will end the three game road-trip on Saturday night in Portland.